DSM' is a weak adaptation of 'Infidel' which should have been made with total faith and belief in its original concept, rather than having an atheist approach over it. On one count at least, this film should pose no sankat to anybody. It is easy to rate Dharam Sankat Mein: one star for intention, but only half for execution. Director Fuwad Khan should get the credit for choosing a sensitive subject with the right kind of intention, but unfortunately, the end result is far from what it could have been. Lastly, considering the fact that the content of the film is well taken, it becomes an interesting and entertaining watch! Another satirical peek at religion but less clever than OMG and PK.. in a rare casting coup where three btown brilliant talents Naseeruddin Shah, Paresh Rawal and Annu Kapoor unite to shine with remarkable brilliance in their roles but the movie adds nothing new to the genre. That is, of course, if the censor board doesn’t break into your house, place a black curtain on your TV screen and force you to do pradakshina around the nearest temple. 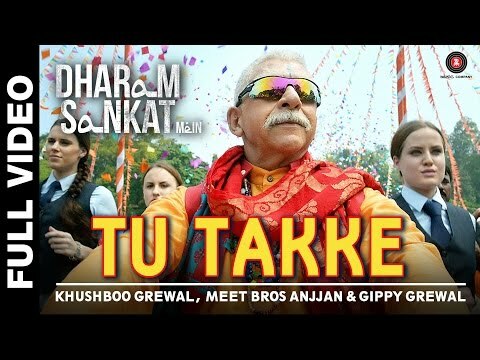 On the whole, DHARAM SANKAT MEIN should be watched for its sheer simplicity and also for the message that has been conveyed through the film. And so, Dharampal takes lessons in Muslim religion, rituals and Urdu language from his neighbour, Mehmood (Annu Kapoor), who is a lawyer by profession. Without him, it would've been an also-ran. It’s not perfect, but it will make you face a few home truths and still leave you feeling happy. Cheers to that! At the box office, success looks certain and it would appeal to the thinking audience.Bharatstudent verdict: Interesting complication, worth watching! A Hindu with an unhealthy hatred for Muslims, who finds out that he’s adopted and born to Muslim parents. Sounds promising, right? It fails to tickle your funny bone and also at serving you with meaningful content. A man who scoffs at religious practices, approaches God in a temple when he faces a life-shattering truth and begs him to 'reduce his punishment' for not following what the godmen preach. Paresh Rawal is one of the finest actors in the Hindi film industry. While the overall plot starts falling apart, Rawal rises to the occasion to deliver a grounded performance. His comedic timing is spot-on and the dramatic bits are also noteworthy. The film has some genuine moments where it drives the point of communal harmony home without being preachy. 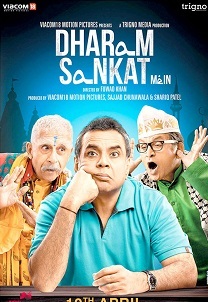 The climax of the film leaves a lot to be desired, but just for its overall theme, Dharam Sankat Mein deserves a watch. Film will depend on exceptional word of mouth to survive as it has no great buzz or marketing awareness.Go for this one for dose entertainment and message! However, a bold attempt and some very good performances by the lead cast may make it worth your while. If you have seen even the first take on this subject, OMG, you have seen it all.